A wonderful use of structural fat is in the reconstruction of breasts after lumpectomy, mastectomy and radiation therapy. Until recently, there has not been a good treatment for the defects or “dents” left after lumpectomy. Fat is uniquely perfect for this task. A small volume of fat can be harvested from the abdomen, hips, or thighs and placed exactly where it is needed to smooth the breast contour. Not only is the tissue natural, and your own (it cannot be rejected as foreign), but the inherent stem cells help to soften and repair radiation-damaged skin. This type of surgery usually takes less than an hour, and recovery is brief and easy. Many women have some kind of reconstruction after mastectomy which leaves them with breasts which are asymmetrical (uneven in size), misshaped, hard and scarred. Structural fat can be used to improve the look of reconstructed breasts in many ways. It can be placed around and over an implant to soften the contours and hide the edges of the implant; it can be used to shape the breast more naturally through precise placement; it can create cleavage; it can improve the look of scars; it can help to heal skin damaged by radiation. For women who have had reconstruction with a TRAM flap or similar surgery, fat can be placed into both the resulting breast and body scars to improve their look. Some women who are diagnosed with breast cancers choose to have a prophylactic simple mastectomy of the non-cancerous breast. 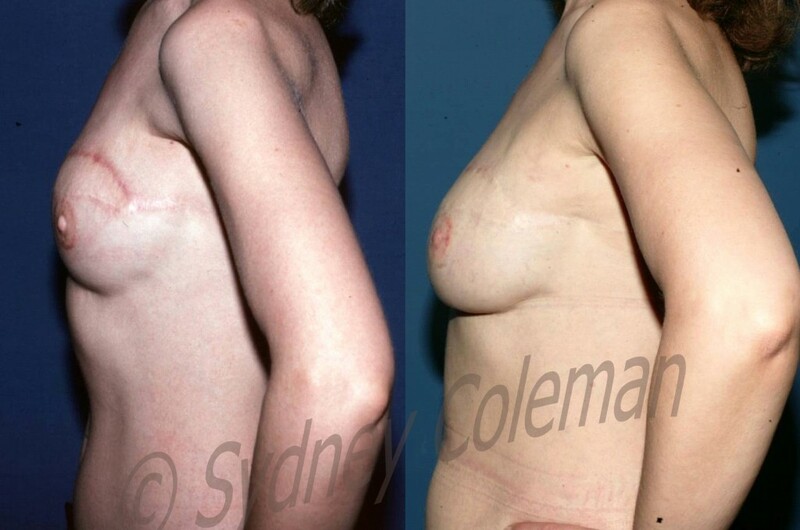 Volume can be restored in these breasts using your own fat instead of implants. Your own fat feels just like breast tissue. Another potential benefit of fat grafting to the breasts can be a reduction in pain. Many patients, particularly those who have had radiation, have pain, stiffness and difficulty with mobility in the chest and arms. Many of our breast cancer patients tell us that not only does radiated skin become softer and more pliable after placement of fat, but the pain that they previously experienced in the irradiated and operated sites is often reduced or eliminated. When fat was first being placed into the breasts after cancer treatment, there was some skepticism from the medical community about whether this procedure would be safe: i.e., would grafted fat make a woman more likely to have a recurrence of breast cancer or make interpretation of future x-ray studies more difficult? This controversy has been answered and the surgical community now accepts that reconstruction with one’s own fat after breast cancer procedures is no more risky than any other procedure. (See link to paper). The most important considerations to make when contemplating fat grafting after breast cancer are to choose an experienced surgeon and an experienced radiologist. Scarring and calcification can occur in breast tissue following any kind of surgery (even in patients who have not had breast cancer). It simply takes a knowledgeable radiologist to determine what is normal after fat grafting. Recovery after fat grafting to the breast is largely a product of how much fat we have to harvest in order to achieve the result we are aiming for: the more fat we harvest, and the more places we have to harvest from, the more uncomfortable the recovery. The breast area is swollen and bruised after surgery, but usually causes little to no pain. The donor sites will be bruised, swollen and sore, and it will hurt to move around for a few days. We like to tell patients that if they can take about 10 days off from work after a bigger surgery, they will usually do well when they return to work. As with any fat grafting procedure, the final result is not seen until 4-6 months after surgery, and the beneficial softening effects of stem cells will continue over many months and even years.